On Friday, the 9th of November 2012, Babson College hosted its flagship event the Babson Entrepreneurship Forum. Celebrating entrepreneurs of all kinds, the event was kicked off with a performance by songwriter Amber Rubarth, and was followed by a keynote from Frans Johansson, CEO of The Medici Group. Various panels and workshops took place throughout the day, broken up by featured keynotes. Frans Johansson is the CEO of the Medici Group and the author of The Click Moment. Johansson shared methods on how to write a “winning book”, how to run a “winning business” and how that passion is so critical for success. Something very peculiar to his keynote was the use of interesting self-designed words. His book, The Click Moment, has been a huge commercial hit and has been translated into 18 different languages. According to , a winning book strategy is to choose a trending topic, create a catchy title and develop a side-door strategy. To create a winning business, one needs to find the “click moment.” Johansson also shared that randomness and serendipity are the by-products of click moment, the factors that really propel a business to success. His methodology is to create a click moments, place purposeful bets and harness the complex forces. Next up were three different panels. The first panel was “Women who mean Business” in which Natalia Oberti Noguera, Founder & CEO of Pipeline Fellowship, Sharon Kan, Co-Founder & CEO of Tikatok and Ruthie Davis, owner of RADesign Inc. and Babson alumnus. The panelists talked about women leadership in the field of entrepreneurship and encouraged women to take entrepreneurship more seriously. The panel “Disrupted: The new Face of the Music Industry” included Mark Kates, founder of Fenway Recordings, Chip Selley, Founder & CEO of DisruptiveApps Inc. and Brian Jonas, agent in High Road Touring. These panelists highlighted the changing trends in the music industry and how this industry is an exciting place to start a business right now. “Startup Fundamentals” with Babson alumnus Bob Davis, general partner of the Highland Capital Partners, discussed the basics of launching a start-up. Another set of panels was scheduled after a break of 20 minutes which really broadened my horizon about entrepreneurship on a global scale and the new trends in marketing. 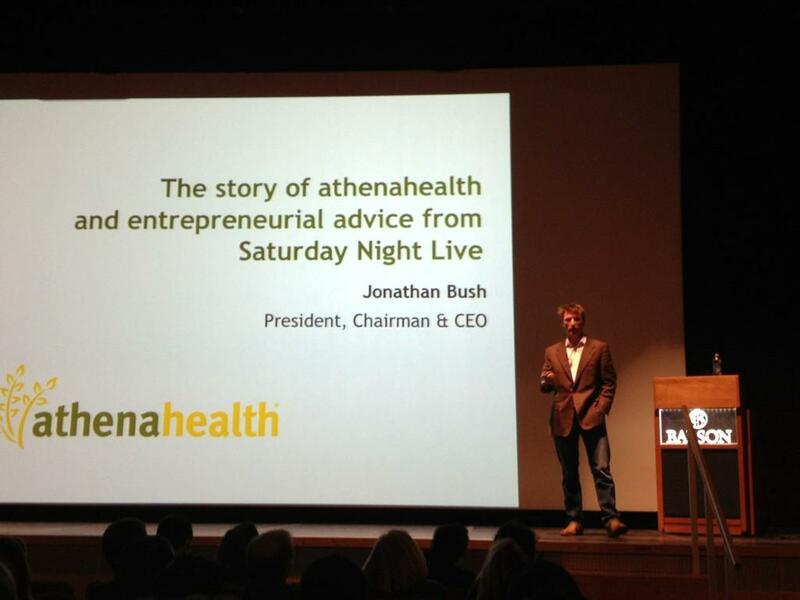 Jonathan Bush, CEO and co-founder of Athenahealth Inc., was the featured lunch keynote. He spoke about how he started his successful venture and what he plans to do in the near future. Bush provided helpful insight on how to start a business in a highly regulated environment (his steps can be used to start any business). His methodology is very visual so try to imaginative. The first step is to get a box. By this he meant to identify an unfulfilled need or a need that can be better fulfilled. The second step is to cut a hole in the box so that one can perform the third step of “putting your junk in the box”. By this he meant that dissect the opportunity and plug in your entrepreneurial remedy. Ultimately the fourth step is to open the box and let the world take advantage of your innovative idea. This methodology was really informative and captured the entrepreneurial thought and action. The afternoon panels included topics on social entrepreneurship, design thinking and building an entrepreneurial ecosystem. The first panel was “Putting the Act in Impact”. The panelists were Vicky Wu Davis, Executive Director & Founder of Youth CITIES, Jonathan Feinman, Executive Director & Founder of Innercity Weightlifting and Kavita Shukla, inventor & Founder of Fenugreen. The three panelists talked about their social entrepreneurial ventures and how they are impacting the society. The “Interconnected: Building Entrepreneurial Ecosystems” panel included Fernando Fabre, President of Endeavor Global, Ray Leach, CEO of Jumpstart, Shelly Porges, Senior Advisor to Global Entrepreneurship Program at U.S Department of State, Eduardo Salazar Yasti, Managing Director of Yuma and Sam Hammar, the Executive Director of The Capital Network. The panelists discussed how entrepreneurship can be promoted on a global scale. 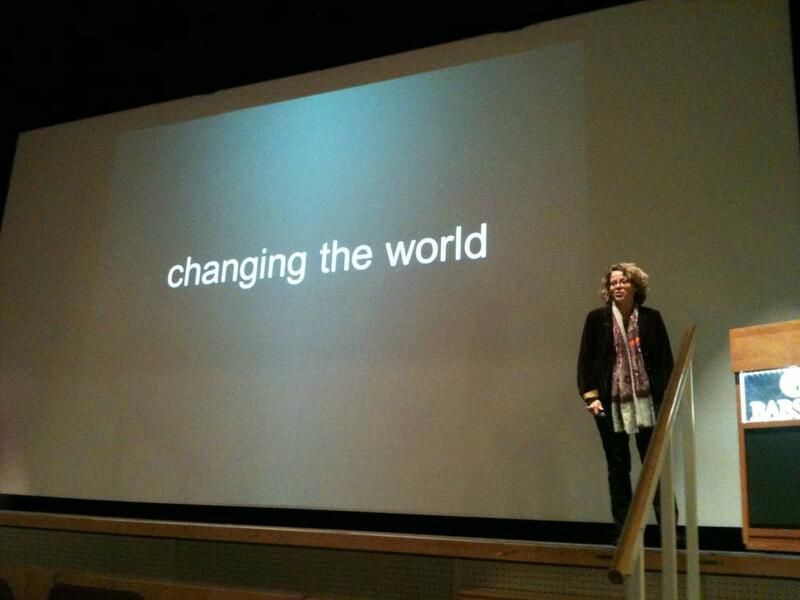 The closing keynote was given by Katie Rae, managing director of TechStars Boston. She shared her life story about how she dreamed of becoming a doctor and helping economies but through a course of events, she ending up starting TechStars Boston. Rae had some helpful tips to share with the audience: let people know the reason behind you pursuing your dreams, be a good listener, the habit of doing is the critical piece of entrepreneurs. Rae closed by sharing that love is the most important word: finding supporters with unconditional love creates the foundation, the home, for any entrepreneur. This closing keynote wrapped up the Babson Entrepreneurship Forum for this year. The forum was successful in bringing out the theme of connecting entrepreneurs of all kinds. The audience was exposed to a variety of entrepreneurs who all had different experiences. It was a great show and looking forward to the next year’s forum.